Indicate the number of shares outstanding of each of the issuer’s classes of common stock, as of the latest practicable date: 24,982,222 shares of common stock outstanding as of August 12, 2011. CleanTech Innovations, Inc., formerly known as Everton Capital Corporation (the “Company” or “CleanTech”), was incorporated on May 9, 2006, in the State of Nevada. Through its wholly owned operating subsidiaries in China, the Company designs, manufactures, tests and sells structural towers for on-land and off-shore wind turbines and manufactures specialty metal products that require advanced manufacturing and engineering capabilities, including bellows expansion joints and connecting bend pipes used for waste heat recycling in steel production and in ultra-high-voltage electricity transmission grids, as well as industrial pressure vessels. The Company authorized an 8-for-1 forward split of its common stock effective July 2, 2010. Prior to the forward split, the Company had 5,501,000 shares of common stock outstanding, and, after giving effect to the forward split, the Company had 44,008,000 shares of common stock outstanding. The effect of the forward stock split was retroactively reflected for all periods presented. The Company acquired Liaoning Creative Bellows Co., Ltd. (“Creative Bellows”) pursuant to the terms of a Share Exchange Agreement and Plan of Reorganization, dated July 2, 2010, as amended. Under the terms of the Share Exchange Agreement, on July 2, 2010, the Company issued 15,122,000 shares of its common stock to the three owners of Creative Bellows and two of their designees to enter into and consummate a series of transactions, described below, by which the Company acquired 100% of Creative Bellows. Concurrently with the Share Exchange Agreement and as a condition thereof, the Company entered into an agreement with Jonathan Woo, the Company’s former Chief Executive Officer and Director, pursuant to which he returned 40,000,000 shares of the Company’s common stock for cancellation. Mr. Woo received $40,000 from the Company for the cancellation of his shares of common stock, which was charged to additional paid-in capital. The $40,000 payment reflected the fair value of the shares in the Company, which was a non-operating public shell with no trading market for its common stock prior to the Share Exchange Agreement. The cancelled shares were retired and, for accounting purposes, the shares were treated as not having been outstanding for any period presented. Upon completion of the foregoing transactions, the Company had 19,130,000 shares of its common stock issued and outstanding. Simultaneously with the foregoing transactions, the Company changed its fiscal year end to December 31. On July 15, 2010, the State Administration of Industry and Commerce (“AIC”) of the People’s Republic of China (“PRC”) issued a Sino-foreign joint venture business license to Creative Bellows, indicating that a capital injection by Wonderful Limited, a British Virgin Islands company, was approved and registering its ownership of a 4.999% equity interest in Creative Bellows. On August 18, 2010, the AIC issued an approval registration of the Company’s capital injection of approximately $23.3 million in cash for approximately 87% of Creative Bellows. Finally, on October 15, 2010, the Company obtained PRC government approval to acquire the remaining minority interest in Creative Bellows held by its original shareholders and Wonderful Limited for approximately $6 million in cash. On October 27, 2010, pursuant to waiver and release agreements, the selling minority shareholders of Creative Bellows waived their rights to receive cash for their equity interests for a mutual release of claims. As a result of these transactions, Creative Bellows became a 100% subsidiary of the Company effective October 15, 2010. For accounting purposes, the Share Exchange Agreement and subsequent transactions described above were treated as a reverse acquisition and recapitalization of Creative Bellows because, prior to the transactions, the Company was a non-operating public shell and, subsequent to the transactions, the shareholders of Creative Bellows owned a majority of the outstanding common stock of the Company and exercise significant influence over the operating and financial policies of the consolidated entity. Pursuant to Securities and Exchange Commission (“SEC”) rules, the merger or acquisition of a private operating company into a non-operating public shell with nominal net assets is considered a capital transaction. Accordingly, for accounting purposes, the transaction was treated as a reverse acquisition and recapitalization. Creative Bellows was incorporated in the PRC province of Liaoning on September 17, 2007. Creative Bellows designs and manufactures bellows expansion joints, pressure vessels, wind tower components for wind turbines and other fabricated metal specialty products. 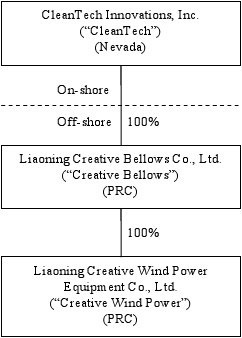 On May 26, 2009, the three individual shareholders of Creative Bellows established Liaoning Creative Wind Power Equipment Co., Ltd. (“Creative Wind Power”). At the end of 2009, the three shareholders transferred their shares to Creative Bellows at cost; as a result of the transfer of ownership, Creative Bellows owned 100% of Creative Wind Power. Creative Wind Power markets and sells wind tower components designed and manufactured by Creative Bellows. The unaudited financial statements included herein were prepared by the Company pursuant to the rules and regulations of the SEC. The information furnished herein reflects all adjustments (consisting of normal recurring accruals and adjustments) that are, in the opinion of management, necessary to fairly present the operating results for the respective periods. Certain information and footnote disclosures normally present in annual financial statements prepared in accordance with accounting principles generally accepted in the United States of America (“U.S. GAAP”) were omitted pursuant to such rules and regulations. These financial statements should be read in conjunction with the audited financial statements and footnotes included in the Company’s 2010 audited financial statements included in the Company’s Annual Report on Form 10-K. The results for the six and three months ended June 30, 2011, are not necessarily indicative of the results to be expected for the full year ending December 31, 2011. The accompanying consolidated financial statements were prepared in conformity with US GAAP. The Company’s functional currency is the Chinese Yuan Renminbi (“RMB”); however, the accompanying consolidated financial statements were translated and presented in United States Dollars (“USD”). The accompanying consolidated financial statements present the historical financial condition, results of operations and cash flows of the operating companies. The consolidated financial statements include the accounts of CleanTech and its wholly owned subsidiaries, Creative Bellows and Creative Wind Power. All intercompany transactions and account balances were eliminated in consolidation. In preparing financial statements in conformity with US GAAP, management makes estimates and assumptions that affect the reported amounts of assets and liabilities and disclosures of contingent assets and liabilities at the dates of the financial statements, as well as the reported amounts of revenues and expenses during the reporting period. Significant estimates include the recoverability of long-lived assets and the valuation of inventories. Actual results could differ from those estimates. Cash and equivalents include cash on hand, demand deposits placed with banks or other financial institutions and all highly liquid investments with an original maturity of three months or less as of the purchase date of such investments. Restricted cash consists of a percentage of sales deposited by the Company into its bank accounts according to contract terms and which serves as a contract execution and product delivery guarantee. The restriction is released upon customer acceptance of the product. The Company maintains reserves for potential credit losses on accounts receivable. Management reviews the composition of accounts receivable and analyzes historical bad debts, customer concentrations, customer creditworthiness, current economic trends and changes in customer payment patterns to evaluate the adequacy of these reserves. The past due receivables are determined based on contractual payment terms specified in the contract. The Company does not anticipate any significant credit risk because the majority of its customers are large, well-capitalized state-owned and publicly traded utility and industrial companies with stable operations. Based on its historical collection activity, the Company had allowances for bad debts of $23,174 and $8,884 at June 30, 2011, and December 31, 2010, respectively. At June 30, 2011 and December 31, 2010, the Company had retentions receivable for product quality assurance of $3,371,028 and $2,566,113, respectively. The retention generally is 10% of the sales price with terms of 1-2 years, but no later than the termination of the warranty period. Current retentions receivable of $2,371,079 and $105,911 at June 30, 2011, and December 31, 2010, respectively, are current and due within one year; $999,949 and $2,460,202 of the retentions receivable are long-term at June 30, 2011, and December 31, 2010, respectively. The Company has not encountered any significant collectability issue with respect to the retention receivables. The Company’s inventories are valued at the lower of cost or market, with cost determined on a weighted average basis. The Company compares the cost of inventories with market value and allowance made to write down the inventories to their market value, if lower. Right to use land is stated at cost less accumulated amortization. Amortization is provided using the straight-line method over 50 years. Recoverability of long-lived assets to be held and used is measured by comparing the carrying amount of an asset to the estimated undiscounted future cash flows expected to be generated by the asset. If the carrying amount of an asset exceeds its estimated undiscounted future cash flows, an impairment charge is recognized by the amount by which the carrying amount of the asset exceeds the fair value of the assets. Fair value is generally determined using the asset’s expected future discounted cash flows or market value, if readily determinable. Based on its review, the Company believes that as of June 30, 2011, and December 31, 2010, there were no significant impairments of its long-lived assets. The Company utilizes Statement of Financial Accounting Standards (“SFAS”) No. 109, “Accounting for Income Taxes,” codified in Financial Accounting Standards Board (“FASB”) Accounting Standards Codification (“ASC”) Topic 740, which requires recognition of deferred tax assets and liabilities for expected future tax consequences of events that were included in the financial statements or tax returns. Under this method, deferred income taxes are recognized for the tax consequences in future years of differences between the tax bases of assets and liabilities and their financial reporting amounts at each period end based on enacted tax laws and statutory tax rates applicable to the periods in which the differences are expected to affect taxable income. Valuation allowances are established, when necessary, to reduce deferred tax assets to the amount expected to be realized. The Company follows FASB Interpretation No. 48, “Accounting for Uncertainty in Income Taxes” (“FIN 48”), codified in FASB ASC Topic 740. When tax returns are filed, it is likely that some positions taken would be sustained upon examination by the taxing authorities, while others are subject to uncertainty about the merits of the position taken or the amount of the position that would be ultimately sustained. The benefit of a tax position is recognized in the financial statements in the period during which, based on all available evidence, management believes it is more likely than not that the position will be sustained upon examination, including the resolution of appeals or litigation processes, if any. Tax positions taken are not offset or aggregated with other positions. Tax positions that meet the more-likely-than-not recognition threshold are measured as the largest amount of tax benefit that is more than 50 percent likely of being realized upon settlement with the applicable taxing authority. The portion of the benefits associated with tax positions taken that exceeds the amount measured as described above is reflected as a liability for unrecognized tax benefits along with any associated interest and penalties that would be payable to the taxing authorities upon examination. Interest associated with unrecognized tax benefits are classified as interest expense and penalties are classified in selling, general and administrative expenses in the statements of income. At June 30, 2011 and December 31, 2010, the Company did not take any uncertain positions that would necessitate recording a tax-related liability. The Company’s revenue recognition policies are in compliance with SEC Staff Accounting Bulletin (“SAB”) 104 (codified in FASB ASC Topic 605). Sales revenue, including the final 10% of the purchase price, is recognized after delivery is complete, customer acceptance of the product occurs and collectability is reasonably assured. Customer acceptance occurs after the customer puts the product through a quality inspection, which normally is completed within one to two weeks from customer receipt of the product. The customer is responsible for installation and integration of our component products into their end products. Payments received before satisfaction of all relevant criteria for revenue recognition are recorded as unearned revenue. Unearned revenue consists of payments received from customers prior to customer acceptance of the product. The Company’s standard payment terms in its arrangements with its wind tower customers generally provide that 10% of the purchase price is due upon the Company’s deposit of restricted cash into a bank account as a contract guarantee, 20% upon the Company’s purchase of raw material for the order, 10% upon delivery of the base ring component of the wind towers, 30% upon delivery of the wind tower tube sections and 20% upon customer inspection and acceptance of the product, which customers normally complete within 1-2 weeks after delivery. As a common practice in the manufacturing business in China, payment of the final 10% of the purchase price is due no later than the termination date of the product warranty period, which can be up to 24 months from the customer acceptance date. The final 10% of the purchase price is recognized as revenue upon customer acceptance of the product. For the Company’s bellows expansion joints and pressure vessels, payment terms are negotiated on a case-by-case basis and these payment percentages and terms may differ for each customer. Sales revenue represents the invoiced value of goods, net of value-added tax (“VAT”). The Company’s products sold and services provided in China are subject to VAT of 17% of the gross sales price. This VAT may be offset by VAT paid by the Company on raw materials and other materials included in the cost of producing the finished product. The Company recorded VAT payable and VAT receivable net of payments in the financial statements. The VAT tax return is filed offsetting the payables against the receivables. The Company offers a warranty to its customers on its products of up to 24 months depending on the terms negotiated with each customer. During the warranty period, the Company will repair or replace defective products free of charge. The Company commenced production in 2009 and as of June 30, 2011, the Company accrued $10,801 in warranty expense. The Company implemented internal manufacturing protocols designed to ensure product quality beginning from the receipt of raw materials to the final inspection at the time products are shipped. The Company monitors warranty claims and accrues for warranty expense accordingly, using ASC Topic 450 to account for its standard warranty. The Company provides its warranty to all customers and does not consider it an additional service; rather, the warranty is considered an integral part of the product’s sale. There is no general right of return indicated in the contracts or purchase orders. If a product under warranty is defective or malfunctions, the Company is responsible for fixing it or replacing it with a new product. The Company’s products are its only deliverables. The Company provides after-sales services at a charge after expiration of the warranty period. Such revenue is recognized when such service is provided. For the six and three months ended June 30, 2011, there was no after-sales services income. Cost of goods sold consists primarily of material, labor and related overhead, which is attributable to the products, and other indirect costs that benefit all products. Write-down of inventory to lower of cost or market is also recorded in cost of goods sold. Research and development costs are related primarily to the Company’s development and testing of its new technologies that are used in the manufacturing of bellows-related products. Research and development costs are expensed as incurred. For the six months ended June 30, 2011 and 2010, research and development was $114,660 and $2,674, respectively, and was included in general and administrative expenses. For the three months ended June 30, 2011 and 2010, research and development was $53,531 and $705, respectively. Subsidy income included grants from LiaoNing Province Finance Bureau to support the Company’s special technology development project and Science and Technology Support Grant from the Administrative Committee of Liaoning Province Tieling Economic & Technological Development Zone to attract businesses with high-tech products to such zone. This latter grant was without any conditions and restrictions, did not require repayment and was exempt from income tax in 2008. The grant is determined based on the investment made by the Company, its floor space occupied in such zone and certain taxes paid by the Company. Subsidy income is subject to PRC statutory income tax. In addition, the Company received $998,000 and $198,000 during the six and three months ended June 30, 2011, respectively, and $1,007,000 and $634,000 during the six and three months ended June 30, 2010, respectively, from the local government in recognition of the Company becoming a U.S.-listed company. Shipping and handling costs for delivery of finished goods are included in selling expenses. During the six months ended June 30, 2011 and 2010, shipping and handling costs were $534,037 and $42,804, respectively. During the three months ended June 30, 2011 and 2010, shipping and handling costs were $307,009 and $22,922, respectively. Cash includes cash on hand and demand deposits in accounts maintained within China. Certain financial instruments, which subject the Company to concentration of credit risk, consist of cash. Balances at financial institutions within China are not covered by insurance. The Company has not experienced any losses in such accounts. The operations of the Company are located in the PRC. Accordingly, the Company’s business, financial condition and results of operations may be influenced by the political, economic and legal environments in the PRC, as well as by the general state of the PRC economy. In accordance with SFAS No. 95, “Statement of Cash Flows,” codified in FASB ASC Topic 230, cash flows from the Company’s operations are calculated based upon local currencies. As a result, amounts related to assets and liabilities reported on the statement of cash flows may not necessarily agree with changes in the corresponding balances on the balance sheet. The Company accounts for its stock-based compensation in accordance with SFAS No. 123R, “Share-Based Payment, an Amendment of FASB Statement No. 123” (codified in FASB ASC Topics 718 and 505). The Company recognizes in the income statement the grant-date fair value of stock options and other equity-based compensation issued to employees and non-employees. The accompanying consolidated financial statements are presented in USD. The Company’s functional currency is RMB, which is translated into USD for balance sheet accounts using the current exchange rates in effect as of the balance sheet date and for revenue and expense accounts using the average exchange rate during the fiscal year. The translation adjustments are recorded as a separate component of stockholders’ equity, captioned accumulated other comprehensive income (loss). Gains and losses resulting from transactions denominated in foreign currencies are included in other income (expense) in the consolidated statements of operations. The Company uses SFAS No. 130 “Reporting Comprehensive Income” (codified in FASB ASC Topic 220). Comprehensive income is comprised of net income and all changes to the statements of stockholders’ equity, except those due to investments by stockholders, changes in paid-in capital and distributions to stockholders. Comprehensive income for the six and three months ended June 30, 2011 and 2010, included net income and foreign currency translation adjustments. SFAS No. 131, “Disclosures about Segments of an Enterprise and Related Information” (codified in FASB ASC Topic 280), requires use of the “management approach” model for segment reporting. The management approach model is based on the way a company’s management organizes segments within the company for making operating decisions and assessing performance. Reportable segments are based on products and services, geography, legal structure, management structure or any other manner in which management disaggregates a company. Management determined that the Company’s product lines – wind towers, bellows expansion joints and pressure vessels – constitute a single reportable segment under ASC 280. The Company operates exclusively in one business: the design and manufacture of highly engineered metal components for heavy industry. The manufacturing processes for each of the Company’s products, principally the rolling and welding of raw steel materials, make use of the same pool of production workers and engineering talent for design, fabrication, assembly and testing. The Company’s products are characterized and marketed by their ability to withstand temperature, pressure, structural load and other environmental factors. The Company’s products are used by major electrical utilities and large-scale industrial companies in China specializing in heavy industry, and the Company’s sales force sells its products directly to these companies, which utilize the Company’s components in their finished products. All of the Company’s long-lived assets for production are located in its facilities in Tieling, Liaoning Province, China, and operate within the same environmental, safety and quality regulations governing industrial component manufacturing companies. The Company established its subsidiary, Creative Wind Power, solely for the purpose of marketing and selling the Company’s wind towers, which constitute the structural support cylinder for an industrial wind turbine installation. Management believes that the economic characteristics of the Company’s product lines, specifically costs and gross margin, will be similar as production increases and labor continues to be shared across products. As a result, management views the Company’s business and operations for all product lines as a blended gross margin when determining future growth, return on investment and cash flows. Accordingly, management has concluded that the Company had one reportable segment under ASC 280 because: (i) all of the Company’s products are created with similar production processes, in the same facilities, under the same regulatory environment and sold to similar customers using similar distribution systems; and (ii) gross margins of all product lines have been converging and should continue to converge. Advances to suppliers mainly consisted of prepayments to suppliers for raw material, equipment purchases and acquisition of land use right. The Company sold goods to its customers and received commercial notes (bank acceptances) from them in lieu of payment for accounts receivable. The Company discounted these notes with a bank or endorsed notes to vendors for payment of its obligations or to get cash from third parties. Most of the commercial notes have a maturity of less than six months. These notes receivable are with recourse and the Company is contingently liable to make the payment to the endorsee in case of a default. On June 10, 2009, Creative Bellows entered into an investment with a credit union and purchased 600,000 credit union shares for $92,713 (RMB 600,000). As a result of this investment, Creative Bellows became a 0.57% shareholder of the credit union. The Company accounted for this investment using the cost method. There was no significant impairment of this investment at June 30, 2011, and December 31, 2010. Current portion of prepayments included prepaid quarterly interest for a long-term loan and prepayment for legal services. Noncurrent portion of the prepayments mainly represented prepaid land occupancy fee to the inhabitants of the land on which the Company plans to construct a manufacturing plant. Currently, the Company amortizes prepaid rental over a period of 50 years according to the terms of the lease agreement. At June 30, 2011, the Company had construction in progress of $708,423 to rebuild and improve the workshop ground and road. Total construction cost of approximately $776,000 is expected to be completed in November 2011. The Company was committed to pay additional $67,000 at June 30, 2011. Depreciation for the six months ended June 30, 2011 and 2010, was $256,077 and $47,911, respectively. Depreciation for the three months ended June 30, 2011 and 2010, was $130,304 and $45,821, respectively. Intangible assets consisted of land use right and patents. All land in the PRC is government-owned and cannot be sold to any individual or company. However, the government grants the user a “land use right” to use the land. The Company has the right to use the land for 50 years and amortizes the right on a straight-line basis over 50 years. The Company has been granted an exclusive license to use a production method patent for lead-free soft solder with mischmetal from the Shenyang Industry University until December 31, 2016. The Company paid a one-time use of technology fee of RMB 100,000 ($15,200). The Company records payments received from customers in advance of their future orders to advance account. These orders normally are delivered within a reasonable period of time based upon contract terms with the customers. On May 24, 2010, the Company borrowed $387,997 with interest of 5.346% from a bank. The maturity date was November 24, 2010. The loan was collateralized by raw material inventory and the personal guarantee of the Company’s CEO together with a third party’s guarantee. As of November 23, 2010, the loan was repaid, and on November 24, 2010, the Company borrowed $362,390 from the same bank with interest of 5.610%. The maturity date of the new loan was May 24, 2011. The loan was collateralized by raw material inventory. On December 23, 2010, the Company repaid $120,797 to the bank. On January 26, 2011, the remaining balance of the loan was repaid by the Company. On September 13, 2010, the Company borrowed $1,776,995, $927,128 and $1,004,388 from three different credit unions. Each loan bore interest of 7.2% and matures September 12, 2011. These loans were collateralized by one of the Company’s buildings and its land use right. On December 13, 2010, the Company entered into a loan with a lender for $10 million. The loan bore interest of 10% payable in advance at the beginning of each quarter with a maturity of March 1, 2012. As of June 30, 2011, the Company had prepaid interest of $208,904. At June 30, 2011, the Company had short-term loans outstanding of $13,708,511. On September 21, 2009, the Company entered into a construction contract with a local authority, the Administration Committee for Liaoning Special Vehicle Production Base (“LSVPB”), to build a plant for the Company. LSVPB was responsible for the construction of the main body of the plant and the Company was responsible for the construction of certain infrastructure for the plant, including plumbing, heating and electrical systems. The plant is 9,074 square meters with construction costs of RMB 1,350 ($206) per square meter. LSVPB was responsible for hiring a qualified construction team according to the Company’s approved design and the Company needed to approve any material changes to the design during construction. LSVPB was also responsible for site survey, quality supervision and completion of inspection, and transfer of all construction completion records to the Company. Upon completion of its ownership registration, the Company was required to pledge the plant as collateral for payment by the Company to LSVPB of $1,868,388 (RMB 12,249,900). The pledge will terminate upon payment in full by the Company. The Company will pay LSVPB for the cost of the project in five equal annual installments in October of each year starting October 2010. The Company is not required to pay interest. Ownership of the plant will transfer to the Company upon payment in full by the Company. The default penalty will be 0.5% of the amount outstanding, compounded daily, in the event of a default. LSVPB has the right to foreclose on the plant if payments are in arrears for more than two years, in which case all prior payments made by the Company will be treated as liquidated damages by LSVPB. As of June 30, 2011, the Company has not yet made the first payment to LSVPB under consent from LSVPB. The Company recorded the cost of construction at the present value of the five annual payments by imputing interest of 9% from when the Company started using the plant. Amortization of the cost commenced on the date of occupation and use. The Company started using the plant on August 30, 2010. The Company expects to file for ownership registration in 2011. Three customers accounted for 68% of sales for the six months ended June 30, 2011, and each customer accounted for 37%, 17% and 14% of total sales, respectively. Three customers accounted for 60% of sales for the three months ended June 30, 2011, and each customer accounted for 28%, 18% and 15% of total sales, respectively. At June 30, 2011, total receivables from these customers was $5,044,318. One customer accounted for 59% of sales for the six months ended June 30, 2010, and one customer accounted for 68% of sales for the three months ended June 30, 2010. At June 30, 2010, total receivable from this customer was $991,271. One vendor accounted for 42% of purchases for the six months ended June 30, 2011. For the three months ended June 30, 2011, one vendor accounted for 14% of the purchases. At June 30, 2011, there was no payable to this vendor. Two vendors accounted for 73% of the purchases for the six months ended June 30, 2010 with each vendor accounted for 53% and 20% of the purchases, respectively. For the three months ended June 30, 2010, one vendor accounted for 88% of the purchases. At June 30, 2010, total payable to these vendors was $666,023. The Company is subject to income taxes by entity on income arising in or derived from the tax jurisdiction in which each entity is domiciled. CleanTech, the U.S. parent company, was incorporated in the U.S. and has net operating losses (NOL) for income tax purposes. CleanTech has NOL of $1,150,000 as at June 30, 2011, which may be available to reduce future years’ taxable income as NOL can be carried forward up to 20 years from the year the loss is incurred. Management believes the realization of benefits from these losses remains uncertain due to CleanTech’s limited operating history and continuing losses. Accordingly, a 100% deferred tax asset valuation allowance was provided. Creative Bellows and Creative Wind Power generated substantially all of their net income from their PRC operations and are governed by the Income Tax Law of the PRC for privately-run enterprises, which generally are subject to tax at a rate of 25% on income reported in the financial statements after appropriate tax adjustments. According to the new income tax law that became effective January 1, 2008, new high-tech enterprises given special support by the PRC government are subject to an income tax rate of 15%. Creative Bellows was recognized as a new high-tech enterprise and registered its status with the tax bureau, providing it with an income tax rate of 15% from 2010 through 2012. There were no material temporary differences that resulted in deferred taxes as of June 30, 2011 and 2010. If Creative Bellows had not been granted high-tech enterprise status, income tax expense for the six months ended June 30, 2011, would have been increased by $169,000 and earnings per share would have been reduced by $0.01. On January 29, 2010, three shareholders contributed $922,900 to the Company. On March 2, 2010, a third party contributed equipment with a fair value of $820,300 to the Company and became a shareholder; simultaneously, the three shareholders bought this third party’s ownership interest and became 100% owners of the Company. On April 15, 2010, one shareholder injected $1,025,654 in cash to the Company. On July 5, 2010, a third party injected $167,702 to the Company as a cash contribution and became a shareholder. On July 12, 2010, the Company completed a private placement in which it sold 3,333,322 units, consisting of one share of its common stock and a warrant to purchase 15% of one share of its common stock, at $3.00 per unit for a total of $10,000,000. The warrants are immediately exercisable, expire on the third anniversary of their issuance and entitle the holders to purchase up to 499,978 shares of the Company’s common stock at $3.00 per share. The Company may call the warrants at any time after (i) the registration statement registering the common stock underlying the warrants becomes effective, (ii) the common stock is listed on a national securities exchange and (iii) the trading price of the common stock exceeds $4.00. The Company also issued warrants, having the same terms and conditions as the warrants issued in the private placement, to purchase 333,332 shares of its common stock to the placement agents in the private placement. The warrants issued in this private placement are exercisable for a fixed number of shares, solely redeemable by the Company and not redeemable by the warrant holders. Accordingly, such warrants are classified as equity instruments. The Company accounted for the warrants issued to the investors and placement agents based on the fair value method under ASC Topic 505. The fair value of the warrants was calculated using the Black-Scholes model and the following assumptions: estimated life of 3 years, volatility of 147%, risk-free interest rate of 1.89% and dividend yield of 0%. No estimate of forfeitures was made as the Company has a short history of granting options and warrants. The fair value of the warrants at grant date was $5,903,228. The Company received net proceeds of $8.4 million from this private placement. The commission and legal cost associated with this offering was $1.6 million. During the six and three months ended June 30, 2011, there were 19,500 and 600 warrants exercised into common stock for $58,500 and $1,800, respectively. On December 13, 2010, the Company completed a closing of $20,000,000 in a combination of debt and equity offerings through accredited institutional investors. In a private placement of equity, the Company sold 2,500,000 units, consisting of one share of its common stock and a warrant to purchase 67.5% of one share of its common stock, at $4.00 per unit for $10,000,000. The warrants are immediately exercisable, expire on the fifth anniversary of their issuance and entitle the holders to purchase up to 1,687,500 shares of the Company’s common stock at $4.00 per share. For its assistance in the private placement of equity, the Company paid a placement agent $1,000,000 and issued it warrants to purchase 300,000 shares of the Company’s common stock under the same terms as the warrants issued in the private placement. The Company also paid the placement agent $100,000 for its assistance in arranging the loan. The fair value of the warrants was calculated using the Black-Scholes model and the following assumptions: estimated life of 5 years, volatility of 102%, risk-free interest rate of 1.89% and dividend yield of 0%. No estimate of forfeitures was made as the Company has a short history of granting options and warrants. The fair value of the warrants at grant date was $10,957,039. Concurrently with the closing of the private placement on December 13, 2010, the Company entered into a long-term loan agreement with a lender for $10 million. The loan bore interest of 10% payable in advance at the beginning of each quarter with a maturity of March 1, 2012 (See Note 14). On July 13, 2010, the Company granted non-statutory stock options to its one independent U.S. director. The terms of the options are: 30,000 shares at an exercise price per share of $8.44, with a life of 3 years and vesting over 2 years with 10,000 shares vested on the grant date and the remainder to vest in increments of 10,000 shares on each subsequent anniversary of the grant date, subject in each case to the director continuing to be associated with the Company as a director. The options were valued using a volatility of 147%, risk-free interest rate of 1.89% and dividend yield of 0%. No estimate of forfeitures was made as the Company has a short history of granting options. The grant date fair value of the options was $203,235. On December 16, 2010, the Company granted non-statutory stock options to its other independent U.S. director. The terms of the options are: 30,000 shares at an exercise price per share of $8.40, with a life of 3 years and vesting over 2 years with 10,000 shares vested on the grant date and the remainder to vest in increments of 10,000 shares on each subsequent anniversary of the grant date, subject in each case to the director continuing to be associated with the Company as a director. The options were valued using a volatility of 102%, risk-free interest rate of 1.89% and dividend yield of 0%. No estimate of forfeitures was made as the Company has a short history of granting options. The grant date fair value of the options was $149,847. On February 21, 2011, the director resigned his position from the Company. Accordingly, the unvested 20,000 shares were forfeited. Pursuant to the option agreement, the 10,000 options vested to this independent director expired unexercised as of May 22, 2011. Based on the fair value method under SFAS No. 123 (Revised) “Share Based Payment” (“SFAS 123(R)”) (codified in FASB ASC Financial Instruments, Topic 718), the fair value of each stock option granted is estimated on the date of the grant using the Black-Scholes option pricing model. The Black-Scholes option pricing model has assumptions for risk-free interest rates, dividends, stock volatility and expected life of an option grant. The risk-free interest rate is based upon market yields for U.S. Treasury debt securities at a maturity near the term remaining on the option. Dividend rates are based on the Company’s dividend history. The stock volatility factor is based on the historical volatility of the Company’s stock price. The expected life of an option grant is based on management’s estimate. The fair value of each option grant to independent directors is calculated by the Black-Scholes method and is recognized as compensation expense over the vesting period of each stock option award. There were no options exercised during the six and three months ended June 30, 2011. The Company recorded $61,042 and $25,323 as compensation expense for stock options for the six and three months ended June 30, 2011. Options expected to vest at June 30, 2011, were 20,000 shares, weighted average exercise price of $8.44 and weighted-average remaining contractual term of 2.03 years. Pursuant to the corporate law of the PRC effective January 1, 2006, PRC subsidiaries of the Company’s operating subsidiaries in China are required to maintain one statutory reserve by appropriating from its after-tax profit before declaration or payment of dividends. The statutory reserve represents restricted retained earnings. The PRC subsidiaries of the Company are required to transfer 10% of their net income, as determined under PRC accounting rules and regulations, to a statutory surplus reserve fund until such reserve balance reaches 50% of the Company’s registered capital. The surplus reserve fund is non-distributable other than during liquidation and can be used to fund previous years’ losses, if any, and may be utilized for business expansion or converted into share capital by issuing new shares to existing shareholders in proportion to their shareholding or by increasing the par value of the shares currently held by them, provided that the remaining reserve balance after such issue is not less than 25% of the registered capital. Common welfare fund is a voluntary fund into which the Company can elect to transfer 5% to 10% of its net income. The Company did not make any contribution to this fund in six and three months ended June 30, 2011 and 2010. This fund can only be utilized on capital items for the collective benefit of the Company’s employees, such as construction of dormitories, cafeteria facilities and other staff welfare facilities. This fund is non-distributable other than upon liquidation. The Company’s operations in the PRC are subject to specific considerations and significant risks not typically associated with companies in North America and Western Europe. These include risks associated with, among others, the political, economic and legal environments and foreign currency exchange. The Company’s results may be adversely affected by changes in governmental policies with respect to laws and regulations, anti-inflationary measures, currency conversion and remittance abroad, and rates and methods of taxation, among other things. The Company’s sales, purchases and expenses transactions are denominated in RMB and all of the Company’s assets and liabilities are also denominated in RMB. The RMB is not freely convertible into foreign currencies under current PRC law. In China, foreign exchange transactions are required by law to be transacted only by authorized financial institutions. Remittances in currencies other than RMB may require certain supporting documentation in order to affect the remittance. The Company is required to contribute $14.2 million as additional capital to Creative Bellows by July 2012. We are a manufacturer of structural towers for megawatt-class wind turbines and other highly engineered metal components used in the energy and other industries in the People’s Republic of China, which we refer to as China or the PRC. We currently design, manufacture, test and sell structural towers for 1, 1.5 and 3 megawatt, or MW, on-land wind turbines, and believe we have the expertise and manufacturing capacity to provide towers for higher-powered on-land and off-shore turbines. We are currently the only wind tower manufacturer in Tieling, Liaoning Province, which we believe provides us a competitive advantage in supplying towers to the wind-energy-rich northern provinces of China. We also manufacture specialty metal products that require advanced manufacturing and engineering capabilities, including bellows expansion joints and connecting bend pipes used for waste heat recycling in steel production and in ultra-high-voltage electricity transmission grids, as well as industrial pressure vessels. Our products provide solutions for China’s increasing demand for clean energy. We sell our products exclusively in the PRC domestic market. Our current wind tower customers include two of China’s five largest state-owned utilities, which are among the top wind farm operators in China as measured by installed wind capacity. We produce wind towers, a component of wind turbine installations, but do not compete with wind turbine manufacturers. Our specialty metal products are used by large-scale industrial companies involved mainly in the steel and coke, petrochemical, high-voltage electricity transmission and thermoelectric industries. We operate through two wholly owned subsidiaries organized under the laws of the PRC: Liaoning Creative Bellows Co., Ltd. and Liaoning Creative Wind Power Equipment Co., Ltd., which we refer to as Creative Bellows and Creative Wind Power, respectively. Creative Bellows was incorporated on September 17, 2007, and is our wholly foreign-owned enterprise, or WFOE; Creative Bellows owns 100% of Creative Wind Power, which was incorporated on May 26, 2009. Creative Bellows provides the production expertise, employees and facilities to manufacture our wind towers, bellows expansion joints, pressure vessels and other fabricated metal specialty products. Creative Wind Power markets and sells the wind towers designed and manufactured by Creative Bellows. While our significant accounting policies are more fully described in Note 2 to our consolidated financial statements, we believe the following accounting policies are the most critical to aid you in fully understanding and evaluating this management discussion and analysis. Our financial statements are prepared in accordance with generally accepted accounting principles in the United States, or U.S. GAAP. The consolidated financial statements include the accounts of CleanTech, Creative Bellows and Creative Wind Power. All intercompany transactions and account balances are eliminated in consolidation. In preparing financial statements in conformity with U.S. GAAP, management makes estimates and assumptions that affect the reported amounts of assets and liabilities and disclosures of contingent assets and liabilities at the dates of the financial statements, as well as the reported amounts of revenues and expenses during the reporting period. Significant estimates, required by management, include the recoverability of long-lived assets and the valuation of inventories. Actual results could differ from those estimates. We maintain reserves for potential credit losses on accounts receivable. Management reviews the composition of accounts receivable and analyzes historical bad debts, customer concentrations, customer creditworthiness, current economic trends and changes in customer payment patterns to evaluate the adequacy of these reserves. The past due receivables are determined based on contractual payment terms specified in the contract. We do not anticipate any significant credit risk because the majority of our customers are large, well-capitalized state-owned and publicly traded utility and industrial companies with stable operations. The retention is 10% of the sales price with a term of 1-2 years, but no later than the termination of the warranty period. Our revenue recognition policies are in compliance with Securities Exchange Commission (“SEC”) Staff Accounting Bulletin (“SAB”) 104 (codified in Financial Accounting Standards Board (“FASB”) Accounting Standards Codification (“ASC”) Topic 605). Sales revenue, including the final 10% of the purchase price, is recognized after delivery is complete, customer acceptance of the product occurs and collectability is reasonably assured. Customer acceptance occurs after the customer puts the product through a quality inspection, which normally is completed within one to two weeks from customer receipt of the product. The customer is responsible for installation and integration of our products into its end products. Payments received before satisfaction of all relevant criteria for revenue recognition are recorded as unearned revenue. Unearned revenue consists of payments received from customers prior to customer acceptance of the products. Sales revenue represents the invoiced value of goods, net of value-added tax, or VAT. Our products sold and services provided in China are subject to VAT of 17% of gross sales price. This VAT may be offset by VAT paid by us on raw materials and other materials included in the cost of producing the finished product. We recorded VAT payable and VAT receivable net of payments in the financial statements. The VAT tax return is filed offsetting the payables against the receivables. We provide a warranty to our customers on our products of up to 24 months depending on the terms negotiated with each customer. During the warranty period, we will repair or replace defective products free of charge. We do not consider the warranty an additional service; rather, the warranty is considered an integral part of the product’s sale. There is no general right of return indicated in the contracts or purchase orders. If a product under warranty is defective or malfunctions, we are responsible for fixing it or replacing it with a new product. Our products are our only deliverables. We implemented internal manufacturing protocols designed to ensure product quality from the receipt of raw materials to the final inspection at the time products are shipped. We monitor warranty claims and accrue for warranty expense, using ASC Topic 450 to account for our standard warranty. We provide after-sales services at a charge after expiration of the warranty period. We recognize such revenue when such service is provided. The accompanying consolidated financial statements are presented in U.S. dollars, or USD. Our functional currency is the USD, while the functional currency of our wholly owned subsidiaries is the Chinese Yuan Renminbi, or RMB. The functional currencies of our foreign operations are translated into USD for balance sheet accounts using the current exchange rates in effect as of the balance sheet date and for revenue and expense accounts using the average exchange rate during the period. The translation adjustments are recorded as a separate component of stockholders’ equity captioned “Accumulated other comprehensive income.” Gains and losses resulting from transactions denominated in foreign currencies are included in “Non-operating income (expense)” in the consolidated statements of income and comprehensive income. As of the date hereof, there have been no significant fluctuations in the exchange rate for RMB to USD after the balance sheet date. Management determined that our product lines – wind towers, bellows expansion joints and pressure vessels – constitute a single reportable segment under ASC 280. We operate exclusively in one business: the design and manufacture of highly engineered metal components for heavy industry. The manufacturing processes for each of our products, principally rolling and welding of raw steel materials, make use of the same production workers and engineering talent for design, fabrication, assembly and testing. Our products are characterized and marketed by their ability to withstand temperature, pressure, structural load and other environmental factors. Our products are used by major electrical utilities and large-scale industrial companies in China specializing in heavy industry, and our sales force sells our products directly to these companies, which utilize our components in their finished products. All of our long-lived assets for production are located in our facilities in Tieling, Liaoning Province, China, and operate within the same environmental, safety and quality regulations governing industrial component manufacturing companies. We established our subsidiary, Creative Wind Power, solely to market and sell our wind towers, which constitute the structural support cylinder for industrial wind turbines. Management believes the economic characteristics of our product lines, specifically costs and gross margin, will be similar as production increases and labor continues to be shared across products. We initiated sales of our wind towers in the second quarter of 2010 and expect the majority of our sales going forward will be of our wind towers, which have a comparatively lower margin then our bellows expansion joints and pressure vessels because of higher raw material costs. Gross margins for our bellows expansion joints and pressure vessels have decreased since 2010 as we have broadened these product lines to include more components with lower margins and increased sales volume. Higher raw material costs in 2011 decreased our gross margins on all products, but as our overall mix of products and product gross margins continues to broaden and sales volume increases, we expect the gross margins of our product lines to converge and stabilize toward a blended gross margin of approximately 27% to 30%. As a result, management views our business and operations for all product lines as a blended gross margin when determining future growth, return on investment and cash flows. Accordingly, management has concluded that we have one reportable segment under ASC 280 because: (i) all of our products are created with similar production processes, in the same facilities, under the same regulatory environment and sold to similar customers using similar distribution systems; and (ii) gross margins of all product lines have been converging and should continue to converge. The following table presents the consolidated results of operations for the six months ended June 30, 2011 and 2010. Net sales for the six months ended June 30, 2011, increased to $10.12 million from $1.68 million for the six months ended June 30, 2010, an increase of $8.44 million or 501%. Net sales for the six months ended June 30, 2011, consisted of $6.10 million in sales of wind towers, $0.63 million in sales of bellows expansion joints, $1.62 million in sales of pressure vessels and $1.78 million in other sales, while our net sales for the six months ended June 30, 2010, consisted of $0.70 million in sales of bellows expansion joints and $0.99 million in sales of wind tower. The increase in net sales was attributable to our commencement in the second half of 2010 of production and sales of wind towers, which became our main product line in the second quarter of 2010 and continues to experience an increase in demand in 2011. Our wind tower products have higher unit prices but longer production cycles than our other products because our wind towers are customized to order and the selling prices vary based on customer specifications. Cost of goods sold for the six months ended June 30, 2011, increased to $7.77 million from $1.20 million for the six months ended June 30, 2010. Cost of goods sold includes material costs, primarily steel, and labor costs and related overhead. The increase in cost of goods sold is due to the introduction in 2010 and significant increase of production and sales volume of our wind tower products during the six months ended June 30, 2011. Cost of goods sold as a percentage of net sales for the six months ended June 30, 2011, was 77% compared to 71% for the 2010 period. The increase in cost of goods sold as a percentage of sales was mainly due to the commencement and increased sales and production of wind towers in the second quarter of 2010, which have a higher cost compared to our other products because of the raw material costs in proportion to total costs of our wind tower products. Additionally, cost of goods sold as a percentage of sales increased as sales volume increased and our mix of bellows expansion joints and pressure vessels shifted to include lower margin offerings in the product lines. Gross profit for the six months ended June 30, 2011, increased to $2.36 million from $0.49 million for the six months ended June 30, 2010. Profit margin decreased to 23% for the six months ended June 30, 2011, from 29% for the 2010 period, mainly due to the increased cost of goods sold as a percentage of sales. Our sales in 2010 consisted of 41% of bellows expansion joints, which reflected pricing based on lower sales volume of higher margin products with unique customer design requirements and resulted in profit margins of 52%, and 59% of wind towers, which have lower profit margin but high demand. The concentration of higher margin products and low sales volume of bellows expansion joints in 2010 caused an unusually high profit margin that management does not believe is sustainable in the future. In the 2011 period, profit margins for our bellows expansion joint and pressure vessel products decreased from the comparable period of 2010, as expected by management, as we sold a more diversified mix of products. Since the second quarter of 2010, we have increased sales of wind towers, which reduced overall profit margins. Management believes sales of bellows expansion joints and pressure vessels will continue to diversify and wind tower production will continue to increase along with manufacturing efficiency. Operating expenses for the six months ended June 30, 2011, increased to $1.73 million from $0.47 million for the six months ended June 30, 2010. Operating expenses consist of selling, general and administrative expenses. The increase in operating expenses resulted from the increased selling costs of our products as a result of our rapidly increased sales, which included sales commissions, travelling expenses of our sales persons and product shipping costs, and the general expansion of our business, including the expansion of our sales team, increased salary, employee welfare and depreciation expenses. Legal, audit and consulting expenses increased in 2011 as a result of our becoming a U.S. publicly listed company in July 2010. We incurred significant increases in legal expenses for the six months ended June 30, 2011, due to our appealing of NASDAQ’s determination in January 2011 to delist our common stock, which we strongly oppose on procedural grounds, law and fact. We expect to continue to vigorously appeal the delisting decision to the SEC and, if necessary, the U.S. Court of Appeals. As a result, we anticipate incurring additional extraordinary legal fees until this matter is ultimately resolved. Additionally, non-cash operating expenses included compensation of $35,719 for stock options granted to our independent directors. Operating expenses as a percentage of net sales for the six months ended June 30, 2011, were 17% compared to 28% for the 2010 period. This decrease was the result of increased efficiencies resulting from higher sales. Total non-operating income for the six months ended June 30, 2011, was $333,063 and mainly consisted of $997,889 in subsidy income offset by $659,255 in interest expense, while it was $753,597 for the six months ended June 30, 2010, and mainly consisted of $1,007,296 in subsidy income offset by $213,586 in interest expense. Subsidy income included grants from LiaoNing Province Finance Bureau to support our special technology development project, a Science and Technology Support Grant from the Administrative Committee of Liaoning Province Tieling Economic & Technological Development Zone to attract businesses with high-tech products to such zone, and a grant from the local government in recognition of our becoming a U.S.-listed company. Subsidy income is subject to PRC statutory income tax. Net income for the six months ended June 30, 2011, increased to $702,933 from $581,117 for the six months ended June 30, 2010. Net income as a percentage of net sales for the three months ended June 30, 2011, was 7% compared to 35% for the 2010 period. The increase in net income was attributable to increased sales of our products. However, our non-operating income was decreased by increased interest expense from the long-term loan bearing annual interest at 10% and decreased subsidy income received from the PRC government compared to the 2010 period. In addition, our consolidated tax rate is 26.9% for the six months ended June 30, 2011, compared to 24.5% for the 2010 period. The following table presents the consolidated results of operations for the three months ended June 30, 2011 and 2010. Net sales for the three months ended June 30, 2011, increased to $6.19 million from $1.45 million for the three months ended June 30, 2010, an increase of $4.74 million or 327%. Net sales for the three months ended June 30, 2011, consisted of $2.62 million in sales of wind towers, $0.51 million in sales of bellows expansion joints, $1.28 million in sales of pressure vessels and $1.78 million of others, while our net sales for the three months ended June 30, 2010, consisted of $0.46 of bellows expansion joints and $0.99 million in sales of wind towers. The increase in net sales was attributable to our commencement in the second half of 2010 of production and sales of wind towers, which became our main product line in the second quarter of 2010 and continues to experience an increase in demand in 2011. Our wind tower products have higher unit prices but longer production cycles than our other products because our wind towers are customized to order and the selling prices vary based on customer specifications. Cost of goods sold for the three months ended June 30, 2011, increased to $4.91 million from $1.08 million for the three months ended June 30, 2010. Cost of goods sold includes material costs, primarily steel, and labor costs and related overhead. The increase in cost of goods sold is due to the introduction in 2010 and significant increase of production and sales volume of our wind tower products during the three months ended June 30, 2011. Cost of goods sold as a percentage of net sales for the six months ended June 30, 2011, was 79% compared to 75% for the 2010 period. The increase in cost of goods sold as a percentage of sales was mainly due to the commencement and increased sales and production of wind towers in the second quarter of 2010, which have a higher cost compared to our other products because of the raw material costs in proportion to total costs of our wind tower products. Additionally, cost of goods sold as a percentage of sales increased as sales volume increased and our mix of bellows expansion joints and pressure vessels shifted to include lower margin offerings in the product lines. Gross profit for the three months ended June 30, 2011, increased to $1.28 million from $0.37 million for the three months ended June 30, 2010. Profit margin decreased to 21% for the three months ended June 30, 2011, from 25% for the 2010 period due to relatively higher production cost for the wind tower products and increased cost of goods sold as a percentage of sales. Our sales in the three months ended June 30, 2010, consisted of 32% of bellows expansion joints, which reflected pricing based on lower sales volume of higher margin products with unique customer design requirements and resulted in profit margins of 52%, and 68% of wind towers, which have lower gross profit margin but high demand. In the second quarter of 2011, gross profit margins for our bellows expansion joint and pressure vessel products decreased from the comparable period of 2010, as expected by management, as we sold a more diversified mix of products. Since the second quarter of 2010, we have increased sales of wind towers, which reduced overall profit margins. Management believes sales of bellows expansion joints and pressure vessels will continue to diversify and wind tower production will continue to increase along with manufacturing efficiency. Operating expenses for the three months ended June 30, 2011, increased to $0.83 million from $0.26 million for the three months ended June 30, 2010. Operating expenses consist of selling, general and administrative expenses. The increase in operating expenses resulted from the increased selling costs of our products as a result of our increased sales, which included sales commissions, travel expenses of our sales persons and product shipping costs, and the general expansion of our business, including the expansion of our sales team, increased salary, employee welfare and depreciation expenses. Legal, audit and consulting expenses increased in 2011 as a result of our becoming a U.S. publicly listed company in July 2010. We incurred significant increases in legal expenses for the three months ended June 30, 2011, due to our appealing of NASDAQ’s determination in January 2011 to delist our common stock, which we strongly oppose on procedural grounds, law and fact. We expect to continue to vigorously appeal the delisting decision to the SEC and, if necessary, the U.S. Court of Appeals. As a result, we anticipate incurring additional extraordinary legal fees until this matter is ultimately resolved. Operating expenses as a percentage of net sales for the three months ended June 30, 2011, was 14% compared to 17% for the 2010 period. This decrease was the result of increased efficiencies resulting from higher sales. Total non-operating expenses for the three months ended June 30, 2011, were $142,024 and mainly consisted of $197,778 in subsidy income offset by $332,236 in interest expense, while total operating income was $523,389 for the three months ended June 30, 2010, and mainly consisted of $634,067 in subsidy income offset by $109,600 interest expense. Net income for the three months ended June 30, 2011, decreased to $204,806 from $485,964 for the three months ended June 30, 2010. Net income as a percentage of net sales for the second quarter of 2011 was 3% compared to 33% for 2010. The decrease in net income was attributable to our decreased subsidy income compared to the 2010 period and increased interest expense from the long-term loan bearing annual interest at 10%, despite increased sales of our products. Our consolidated tax rate is 34.0% for the three months ended June 30, 2011, while it was 23.7% for 2010. The increased consolidated tax rate for the 2011 period was due to the net operating loss of the U.S. parent company with valuation allowance accounted for as a related deferred tax asset. Operations and liquidity needs are funded primarily through cash flows from operations, short-term borrowings, shareholder contributions and financing through capital markets. The cash was used primarily in operations and plant construction. As of June 30, 2011, we had cash and equivalents of $1,426,864, other current assets of $30,967,978 and current liabilities of $16,354,142. Working capital was $16,040,700 at June 30, 2011. The ratio of current assets to current liabilities was 1.98-to-1 as of June 30, 2011. Net cash used in operating activities was $10.76 million in the six months ended June 30, 2011, compared to $1.88 million in the 2010 period. The increase in net cash used in operating activities during the six months ended June 30, 2011, was due mainly to increased accounts receivable outstanding, note receivable, retentions receivable, and advances to suppliers as a result of our increased production and sales, as well as the timely payment on accounts payables, other payable and taxes payable despite an increase in net income. Net cash used in investing activities was $974,884 during the six months ended June 30, 2011, compared to net cash used in investing activities of $1.56 million during the 2010 period. The cash used in investing activities in the six months ended June 30, 2011, was for the purchase of property and equipment for $273,988 and construction in progress for $700,896. In the 2010 period, we made payments of $1.46 million for property and equipment purchase, $60,134 for intangible assets and a $38,007 for construction of a workshop. Net cash used in financing activities was $0.33 million in the six months ended June 30, 2011, compared to net cash provided by financing activities of $2.67 million in the 2010 period. The increase in cash outflow in 2011 consisted of repayment to shareholder of $164,269 and bank loan of $244,607, despite cash proceeds from warrants exercised of $83,823. In the 2010 period, we borrowed $5,946,097 from a bank and repaid $5,565,156, and received a shareholder cash contribution of $2,285,754. Our standard payment terms with our wind tower customers generally provide that 10% of the purchase price is due upon our deposit of restricted cash into a bank account as a contract guarantee, 20% upon our purchase of raw material for the order, 10% upon delivery of the base ring component of the wind towers, 30% upon delivery of the wind tower tube sections and 20% upon customer inspection and acceptance of the product, which customers normally complete within 1-2 weeks after delivery. As a common practice in the manufacturing business in China, payment of the final 10% of the purchase price is due no later than the termination date of the product warranty period, which can be up to 24 months from the customer acceptance date. For our bellows expansion joints and pressure vessels, payment terms are negotiated on a case-by-case basis and these payment percentages and terms may differ for each customer. We may experience payment delays from time to time of up to six months from the due date, but we expect to receive all payments despite any customer delays in payment. We do not anticipate any significant credit risk because the majority of our customers are large, well-capitalized state-owned and publicly traded utility and industrial companies with stable operations. Furthermore, we do not believe the delays have a significant negative impact on our liquidity as payment delays are very common in the manufacturing industry in China. As of June 30, 2011, we had an accounts receivable of $15,386,282 (before bad debt allowance of $23,174), of which $2,375,582 was current, $3,227,629 had aging over 30 days, $3,181,676 had aging over 90 days and $6,601,395 had aging over 180 days. The significant increase in accounts receivable was due to our increased sales but slow collections on payment because of delays in the completion of installation of wind towers sold to certain customers in 2011. On July 12, 2010, we completed a private placement pursuant to which we sold 3,333,322 units, consisting of one share of our common stock and a warrant to purchase 15% of one share of our common stock, at $3.00 per unit for a total of $10,000,000. The warrants are immediately exercisable, expire on the third anniversary of their issuance and entitle the holders to purchase 499,978 shares of our common stock at $3.00 per share. We may call the warrants at any time after (i) the registration statement registering the common stock underlying the warrants becomes effective, (ii) the common stock is listed on a national securities exchange and (iii) the trading price of the common stock exceeds $4.00. We also issued warrants, having the same terms and conditions as the warrants issued in the private placement, to purchase 333,332 shares of our common stock to the placement agents in the private placement. On December 13, 2010, we completed a closing of $20,000,000 in a combination of debt and equity offerings through accredited institutional investors for working capital to allow us to bid on new wind tower contracts. In a private placement of equity, we sold 2,500,000 units, consisting of one share of our common stock and a warrant to purchase 67.5% of one share of our common stock, at $4.00 per unit for a total of $10,000,000. The warrants are immediately exercisable, expire on the fifth anniversary of their issuance and entitle the holders to purchase 1,687,500 shares of our common stock at $4.00 per share. We also issued warrants, having the same terms and conditions as the warrants issued in the private placement, to purchase 300,000 shares of our common stock to the placement agent in the private placement. Concurrently with this private placement, we entered into a long-term loan agreement, evidenced by a loan agreement and a promissory note, with NYGG (Asia), Ltd. for $10,000,000. The loan bears interest at 10% payable quarterly beginning on December 13, 2010, and has a maturity date of March 1, 2012. In June 2011, FASB issued ASU 2011-05, Comprehensive Income (ASC Topic 220): Presentation of Comprehensive Income. Under the amendments in this update, an entity has the option to present the total of comprehensive income, the components of net income and the components of other comprehensive income either in a single continuous statement of comprehensive income or in two separate but consecutive statements. In both choices, an entity is required to present each component of net income along with total net income, each component of other comprehensive income along with a total for other comprehensive income and a total amount for comprehensive income. In a single continuous statement, the entity is required to present the components of net income and total net income, the components of other comprehensive income and a total for other comprehensive income, along with the total of comprehensive income in that statement. In the two-statement approach, an entity is required to present components of net income and total net income in the statement of net income. The statement of other comprehensive income should immediately follow the statement of net income and include the components of other comprehensive income and a total for other comprehensive income, along with a total for comprehensive income. In addition, the entity is required to present on the face of the financial statements reclassification adjustments for items that are reclassified from other comprehensive income to net income in the statement(s) where the components of net income and the components of other comprehensive income are presented. The amendments in this update should be applied retrospectively and are effective for fiscal years, and interim periods within those years, beginning after December 15, 2011. We currently are assessing the effect that the adoption of this pronouncement will have on our financial statements. We have not entered into any other financial guarantees or other commitments to guarantee the payment obligations of any third parties. We have not entered into any derivative contracts indexed to our shares and classified as stockholders’ equity or not reflected in our consolidated financial statements. Furthermore, we do not have any retained or contingent interest in assets transferred to an unconsolidated entity that serves as credit, liquidity or market risk support to such entity. We do not have any variable interest in any unconsolidated entity that provides financing, liquidity, market risk or credit support to us or engages in leasing, hedging or research and development services with us. On September 21, 2009, we entered into a construction contract with a local authority, the Administration Committee for Liaoning Special Vehicle Production Base, or the LSVPB, to build a plant for us. Under the terms of the construction agreement, LSVPB was responsible for the construction of the plant and we pledged the plant as collateral for our payment to LSVPB of $1,868,388 (RMB 12,249,900) in plant construction costs over five equal annual installment payments starting in October 2010 with $373,678 (RMB 2,449,980) as the first installment amount. As of June 30, 2011, we have not yet made the first payment to LSVPB under consent from LSVPB. On September 13, 2010, we borrowed $1,776,995, $927,128 and $1,004,388 from three different credit unions. Each loan bears interest of 7.2% and matures September 12, 2011. These loans were collateralized by one of our buildings and our land use right. At June 30, 2011, we had short-term loans outstanding of $3,708,511. On December 13, 2010, we entered into a loan with a lender for $10 million. The loan bore interest of 10% payable in advance at the beginning of each quarter with a maturity of March 1, 2012. As of the end of the period covered by this report, we conducted an evaluation under the supervision and with the participation of our management, including the Chief Executive Officer (“CEO”), our principal executive officer, and Chief Financial Officer (“CFO”), our principal financial officer, of the effectiveness of the design and operation of our disclosure controls and procedures (as defined in Rule 13a-15(e) and Rule 15d-15(e) of the Exchange Act). Based on that evaluation, the CEO and CFO concluded that our disclosure controls and procedures were effective as of the date of that evaluation to ensure that information required to be disclosed in the reports that we file or submit under the Exchange Act is recorded, processed, summarized and reported within the time periods specified in Securities and Exchange Commission rules and forms. Disclosure controls and procedures include, without limitation, controls and procedures designed to ensure that information required to be disclosed by us in the reports that we file or submit under the Exchange Act is accumulated and communicated to our management, including our principal executive and principal financial officers, or persons performing similar functions, as appropriate to allow timely decisions regarding required disclosure. There were no changes in our internal control over financial reporting (as such term is defined in Rules 13a-15(f) and 15d-15(f) of the Exchange Act) during our most recently completed fiscal quarter that have materially affected, or are reasonably likely to materially affect, our internal control over financial reporting.